The Tour de France is a harsh and unforgiving test of stamina so it is spurious to make outlandish predictions before the highest summits range into view. It is, however, difficult not to get just a little bit excited that Britain could be about to provide the winner of this great race for the first time. Bradley Wiggins, already a national cycling hero for his previous exploits on the track, is resplendent in yellow on the resumption following a rest day. Not only that, but his lead over rivals including last year’s victor Cadel Evans suggests he may not be headed again before Paris. There is another possibility here though and it is one that few had anticipated. Current form and recent history point to an intriguing subversion of the anticipated plot. Team Sky will be doing everything in their power to secure top place on the podium, but the first British winner of Le Tour might just not be Wiggins after all. Outside the biking world, Chris Froome is a relative unknown. Born in Kenya and raised in South Africa, he now rides for the country of his father’s birth, so is not a direct product of Dave Brailsford’s UK cycling revolution. As Wiggins’ trusted domestique in the mountains, Froome’s potential glories ought to be reflected, but the first week of racing have illustrated that a second avenue to success is available should events so dictate. The former triple Olympic gold medallist certainly deserves his status as team leader; it was always his expected role when the newly formed team made him their marquee signing. Froome was recruited for his climbing ability. Yellow jersey aspirants need reliable support and assistance on the most arduous vertical stages. Initially, at least, his sole objective was to ensure for his colleague the smoothest passage over the peaks. Despite the tough conditioning work which sees him leaner and more lithe than ever, Wiggins is not a pure mountain athlete. For him, the significant gains are most likely in his favoured time-trialling discipline. The attritional uphill demands should see him in more reactive mode, covering the breaks and wearing down his fellow contenders, and in Froome he has the ideal ally to drag him through the steep passes of the Alps and Pyrenees. But such is the fragility of body and spirit, one unexpected crash, a virus or an ill-timed bout of food poisoning, or simple mental degradation, and the best laid plans end up in tatters. Froome’s own time-trial performance which, following his strong showing in winning the only real taxing stage so far, saw him rise to third in the overall standings, was a bonus for his team. It might just also land them with a tactical conundrum. If Wiggins should falter, do Sky switch to a different scenario? Now that they clearly have another bullet to fire, is it practical to risk everything in pursuit of their original goal? Or do they allow Froome to challenge for yellow himself rather than be sacrificed as a rival streaks away from them both? I suppose it depends on a quick assessment of the position as it unfolds but it would be surprising if such a situation had not been thought through. It is unfortunate that Belarusian team-mate Kanstantsin Sivtsov, who would have been a helpful additional presence over the coming days, was forced to abandon earlier with a broken leg. All of this is further complicated by the scheduling of a second, and probably decisive, time-trial on the penultimate day. In theory, Wiggins would have an opportunity to claw back any lost time should his physical state be able, but Froome too has now demonstrated an ability to hold his own in this sphere. So is it fanciful to suggest that Froome could usurp Wiggins as a possible Tour winner? Well, no, as last year’s Vuelta a Espana proves. In finishing second in the General Classification, thus equalling Robert Millar’s record for the best ever British finish in a Grand Tour, Froome not only outlasted Wiggins in the mountains but also outpaced him in a time-trial. It could, of course, be argued that Wiggins is in prime condition now, having structured his season around this bid for ultimate glory, but Froome was himself struggling with the effects of a tropical disease at the time. Furthermore, he completed his first Tour de France as a raw novice back in 2008. And don’t forget, had he not lost over a minute after suffering a puncture on the first stage he would be in an even better position than he is now. 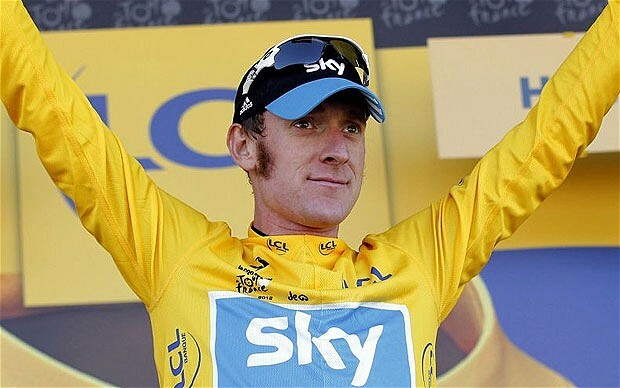 Wiggins finished fourth three years ago, but is not so far ahead in the experience stakes as some might believe. Can Wiggins remain in yellow? Whatever the outcome, these are scarcely believable times for the British cycling enthusiast. To conceive of just one viable contender seemed beyond reason not so long ago. As one who has been at the sharp end of the nation’s incredible rise to prominence both on the track and on the road, Bradley Wiggins will carry the hopes of most of his countrymen in what remains of this iconic event. The ideal turn of affairs would see Chris Froome proudly accompany him on the Champs Elysees podium a week on Sunday. But if circumstances veer from the perfect script, we should be comforted in the knowledge that we now have a second string to our bow. This entry was posted in Cycling and tagged Bradley Wiggins, Chris Froome, Tour de France. Sage Of The North is the personal blog of Phil Hurst. Based in Newcastle upon Tyne in the North East of England, it is a collection of articles, opinions, comments and general ramblings on a range of sporting topics. It is updated regularly and comments are welcome. Join the debate! Is Mickelson An All-Time Great? © Phil Hurst and Sage Of The North, 2012. Unauthorized use and/or duplication of this material without express and written permission from this blog’s author and/or owner is strictly prohibited. Excerpts and links may be used, provided that full and clear credit is given to Phil Hurst and Sage Of The North with appropriate and specific direction to the original content.